Sometimes my lovely assistant Carrie likes to keep good secrets from me, like who's pregnant, what someone's gonna name their baby, how her child is so darn cute. Things like that. It's not too often though that she keeps fashion secrets from me. Until Friday when she spilled the beans about Kate Bosworth's fab customized jewelry mail-order site, Jewelmint. The scoop is that you take a style quiz, and every month Jewelmint (designed by Kate and her stylist) sends you a few selections that complement your personal preferences. You then choose and it arrives to your mailbox with free shipping for like $29 a month. Sounds fun, huh? Way better than a jelly of the month club*. Sidenote: Did Kate Bosworth's acting career peak with Blue Crush? Puffy Coat. Puffy. Hmmmm, that couldn't sound much more unflattering, could it? Fat Coat. Maybe that's worse, but that's about it. 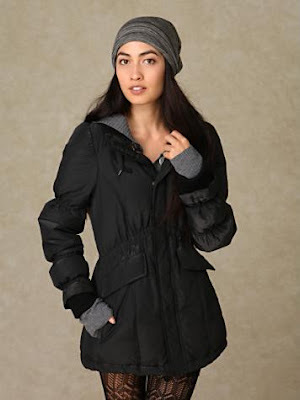 If the thought of buying a puffy coat immediately makes you think diet, well, I've found you some options that have cute waists, and won't make you look like the Michelin Man. There are some occasions where a coat has to be functional and not just cute, i.e. shoots in the freezing cold outside all day, trips to Chicago in mid-winter, Titans games in December...you get my drift. 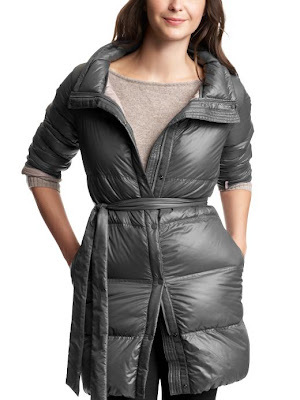 If you feel the same, check out these cute puffy coats on my radar this month. And it has a hood! I just bought this one from the Gap with my ungodly amount of store credit. I haven't given it a try in frigid weather, but I'll let ya know how it goes. 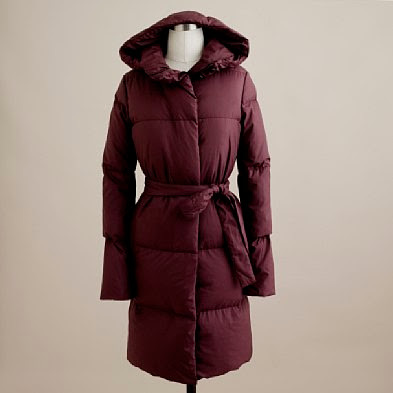 Not many of us are in the market for a 550-dollar puffy coat, but it's oh-so-dreamy isn't it? I love the print! I just got back from Maine where we shot a Kenny Chesney video that will be released, oh, I'm really not sure. But needless to say, it's set in coastal Maine, and I GOT TO GO (squeal!!) Maine was SO beautiful--the leaves were changing, the temps were brisk, and the sun was shining. It was heavenly minus the 16-hour work days...buuuuuutttt, it was all totally worth it! While I was there, I was inspired to work on our dude outfit of the month. 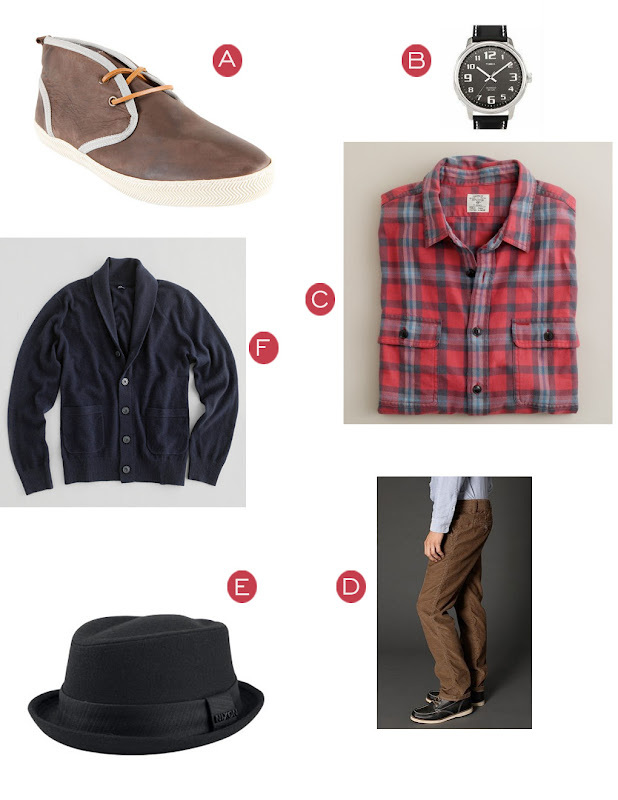 The outfit is a little bit Maine-outdoorsy with the cords and plaid, and a little bit hipster with the shoes and cardigan. It's a hip Maine-ster. This is part of a fishing village where we shot. This lighthouse look familiar? Forrest Gump ended on the East Coast here. A. Steve Madden Peroni Boot, $59. SUCH a versatile shoe. Is it a boot? Is it a shoe? Who knows. Is it awesome? Yes. B. Timex watch, $35. Classic watches like this never go out of style. C. J. Crew vintage flannel shirt, $69.50. I can't get enough of J. Crew right now. D. BDG corduroys, $39. Cannot beat Urban Outfitters' prices for bottoms with a stick. E. Nixon Fletcher hat, $40. I love this hat. It goes with our hip outdoorsy combo and transitions to your dirty v-neck and denim jacket easily. F. L.L. Bean Cashmere shawl-collar Cardigan, $92.50. Look for this cardigan to make an encore appearance in our Fall Must-haves. Sorry guys. I'm still alive. I haven't blogged this week because I've been so busy with the artist whose video you're about to see below. His name is Brett Eldredge, and he is handsome, tall, and has a baritone voice that'll make you quake at the knees. I'm gonna give you fair warning abou this video we did a few months ago with Shaun Silva--there's a 50/50 chance you'll cry when you watch the video. You guys have a good weekend! Got lots of exciting blogging coming your way! I feel so blessed to do what I do...*most* of the time. Like every job, styling has its good days and bad. But I'll tell ya one thing, when I get to work with Joanna Smith, it's ALWAYS a good day. Here's her first video for her single "Gettin' Married". Gals, this will start your Friday off right--this is a hilarious song we can ALL identify with.